UC browser version 8.3 is the latest version of UC editions. It has a lot of features including new Cloud Storage. There users can store their data on UC cloud servers and use anytime. 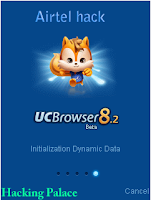 Now, Hacking Palace releases latest UC browser 8.3 cloud edition hacked handler mod for free 3g speed internet in Airtel (with downloading support.using this you can download and Browse unlimited on Airtel Sim with 3G speed. Note that to get 3g speed you must have 3G handset and also 3G network in your area. Now switch your network to UMTS/ WCDMA and follow the instructions below. In 3G network you will get speed of 100- 200 KBPS. For 2G it will be 10- 40 KBPS. the average is 120 and 13 KBPS respectively for 3G and 2G. My friend reported that it is not supporting Compressed Files. Anyway you can Download Music, Videos, Softwares etc. Just follow the instructions below. Note: This version has problems on downloading large files and also for some specific extensions. it is highly recommended to Download new version 8.3.2 hacked for Airtel from here.